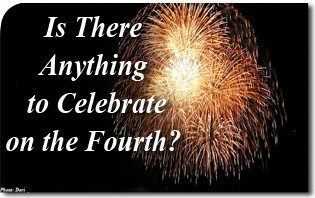 The American TFP > Return to Order > Is There Anything to Celebrate on the Fourth? The cloudy day set the mood for the Fourth of July barbeque. It was a family get-together but there was not much family to get together. Several members were too far away to come; others were on cruises. There were a few absent because they were no longer family since some marriages had turned ugly. But the barbecue was lively as people gathered around the picnic tables eating plenty of ribs, potato salad, corn-on-the-cob and fixings. Not everything was homemade, much less homegrown — there was simply no time for that. As the night progressed, a discussion arose. Almost everyone agreed that Fourth of July was not what it used to be. It used to be so happy. Everyone could remember the times when they would get together and there would be plenty of food, conversation, outdoor games and fireworks. It was a real celebration. Now everyone seemed to be complaining about everything. And so each had their own grievances, some complaining about too much government and others claiming not enough benefits. At the end, someone made the comment that, with this government, there really wasn’t that much to celebrate this Fourth of July. With that, there was a lull in the conversation that left everyone uneasy. Some took advantage of the awkward interval to check their emails on their iPhones or make small talk. And as the talk died down, the grandfather unexpectedly spoke up. He was now a frail old man, a World War II veteran who had known hard times and good times; economic depression and happy days. He had difficulty getting around and spent a lot of his days thinking and praying. Now he stood before them with an air of dignity saying: “Yes, government has changed. But you know something, we’ve changed, too. “When I was growing up, families looked after their own members. We didn’t need or want handouts. We managed, even if we didn’t have the latest gadgets or the best car. When there were problems, everyone pitched in. Times were hard, but we were happier. “Today, it’s all about money. Back then, money didn’t rule everything. People had honor. They were faithful to their spouses and family. People weren’t afraid to be leaders and accept responsibility. “We knew the difference between our government and our country. Politicians are one thing and America is another. Today, people treat our county like a corporation where they expect only dividends. When the going gets tough, everyone abandons her and sells off their shares. That’s not right. A silence hung over the area as darkness was falling and lightning bugs were starting to appear. The old man still continued: “I’m sorry for rambling on but I’ve been thinking a lot about this lately. We need to turn to God again. We used to say ‘give us this day our daily bread’ now everyone turns to the government – they don’t even know how to ask God for things – or what to ask for. The silence was now complete and everyone became pensive. The old man settled down in his lawn chair still apologizing for rambling on. Everyone in their heart knew that he was right. At that moment, a rocket soared into the night and burst in air and the darkness was lit by a marvelous display of light and a mighty boom. There was something grand about the way the fireworks exploded that stirred the hearts of those who watched and filled them with awe and pride. At least for an instant, they forgot about their own problems, and celebrated that special something called America. This entry was posted in Return to Order and tagged America, barbeque, Family, forth, government, grandfather, honor, July, money, Order, organic, return, society, to, virtue by John Horvat II. Bookmark the permalink.